Heat oven to 375°F. Spray 13x9-inch (3-quart) glass baking dish with cooking spray. Spread potatoes evenly in dish. Top with cauliflower. Rub chicken thighs with 1/2 teaspoon of the salt and the red pepper; place in single layer on top of cauliflower. In large microwavable bowl, place 2 tablespoons of the butter. Microwave uncovered on High 30 to 90 seconds or until melted. Stir in flour; microwave 30 to 90 seconds longer or until thickened. Stir in cream, lemon juice, mustard, Worcestershire sauce and remaining 1 1/2 teaspoons salt. Microwave uncovered 1 to 2 minutes or until bubbling at edges. Stir in cheese. Mixture will be thick. Spread evenly over casserole. In small microwavable bowl, place remaining 2 tablespoons butter. Microwave uncovered on High 30 to 90 seconds or until melted. Stir in grated lemon peel and bread crumbs. Sprinkle over casserole. 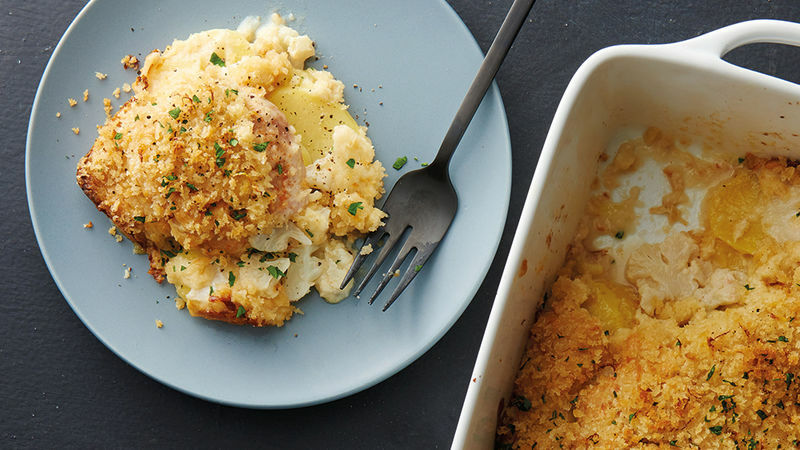 Bake uncovered 50 to 55 minutes or until cauliflower and potatoes are tender, bread crumbs are golden brown and juice of chicken is clear when thickest part is cut (at least 165°F). Top with parsley. Let stand 5 minutes before serving. Snip the fresh parsley leaves with scissors directly over the finished dish for a quick garnish. Chicken thighs vary in size. If yours are quite large, consider cutting in half before rubbing with salt and red pepper.